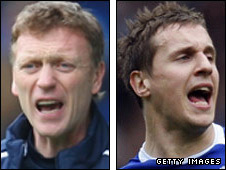 Everton's David Moyes and Phil Jagielka have won the Barclays Premier League Manager and Player of the Month awards. Boss Moyes guided the Toffees to league wins at home to Bolton and West Brom and a draw at Newcastle in February. Defender Jagielka helped Everton keep clean sheets in all three fixtures, and made his first England start in the 2-0 friendly defeat in Spain last month. Moyes has now won the managers' award five times, while it is the first time Jagielka has been honoured. Everton beat Bolton 3-0 and West Brom 2-0 either side of the goalless draw on Tyneside. They also progressed in the FA Cup in February with a replay victory over Merseyside rivals Liverpool, followed by a fifth round win over Aston Villa. Moyes said he was eyeing silverware to add to his award, with Everton facing Middlesbrough in the FA Cup quarter-finals at Goodison Park on Sunday. "Of course I am pleased with the recognition. But it is not for me, it is the players who have done their jobs. It is for the whole club," he said. "What I want is a trophy for the whole club to enjoy now, not just for me. It is hard to drag this award away from Sir Alex Ferguson these days, so that is something to be proud of."